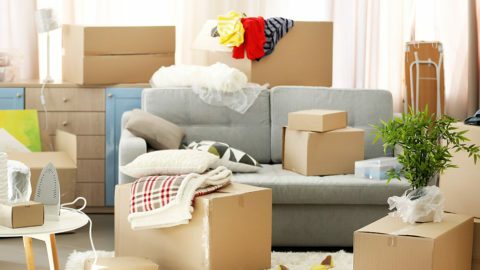 Before you start hauling all your boxes, furniture and heavy appliances toward the front door, let’s touch on a few important points. Different people have different things they need to move, but consider these few points when deciding what kind of hand truck to buy or rent. Whether you’re moving a washing machine or a single plate, don’t go cheap. Get a quality steel hand truck that will stand up to the weight you’ll be putting on it. Get a moving dolly with a strap you can wrap around your refrigerator or dresser, or any other large item. Ask the rental shop or store clerk for a quick lesson on how to ratchet that strap into place. Protip: DO NOT ratchet pressboard items to your hand truck. They are not meant to withstand that sort of pressure and will splinter faster than you can say IKEA. 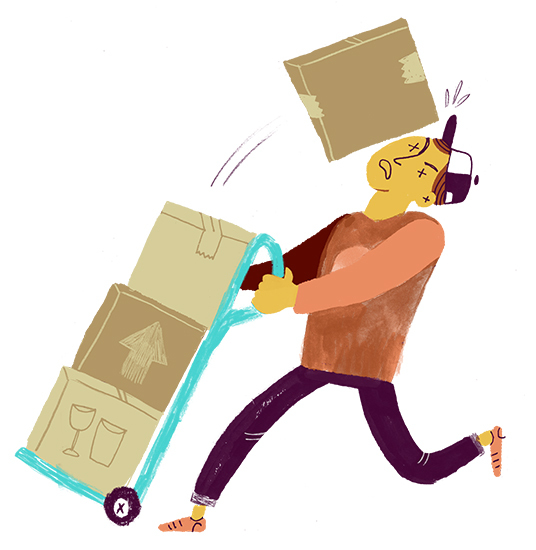 When moving boxes, create straight and balanced stacks that won’t topple over once you’re rolling. Are the boxes not perfectly aligned? 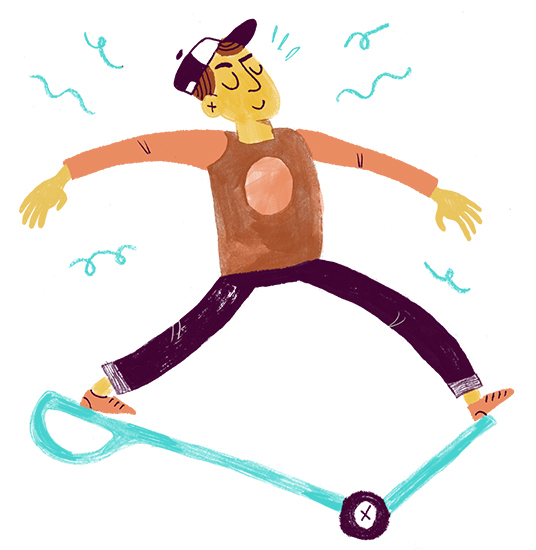 Don’t think you can trick physics, because trust us, you won’t. Make sure your top box is at least partially resting against the vertical part of your hand truck. If it isn’t, it will slide off your stack and slam you in the throat. We speak from experience. Also, avoid topping your stack with a box so big you can’t see over or beyond it. Being able to see where you are going is kind of important. Before you load furniture up, first wrap your bookcase, dresser or any other wooden item with furniture pads so the metal of your hand truck – particularly the bottom plate – doesn’t scratch any surfaces. 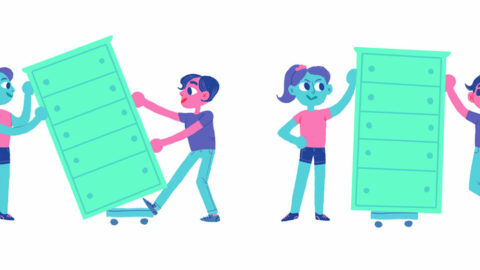 Some items, like desks and horizontal dressers, are easiest to move when stood on end. (You might want to empty your desk drawers first!) Vertical dressers, armoires and other tall items can be hand-trucked upside down, especially if they have legs or flat tops. Again, check what’s inside first and remove or secure any loose items. Protip: It is possible to use your hand truck to lift and carry a dresser or armoire with (very) short legs in an upright fashion. But just know the two little legs will be jutting out precariously and can catch on a doorway threshold or the edge of a step, then snap right off. Use your best judgment with deciding how to truck those fun, short-legged items. When loading washers, dryers and refrigerators, those are best attacked from the rear facing you. This is done to maintain safe weight distribution, as well as to avoid scratching any visible surfaces. So in this order: Unplugging and/or defrost, move your appliance away from the wall, then turn it around. Keep any wires, plugs and hoses off the floor so you don’t roll or step on them. Tie or tape electrical cords to the rear of the appliance (in a way so they won’t get crushed by the hand truck). Hoses might be best snaked into the mouth of your dryer, held in place by the lid or the door. 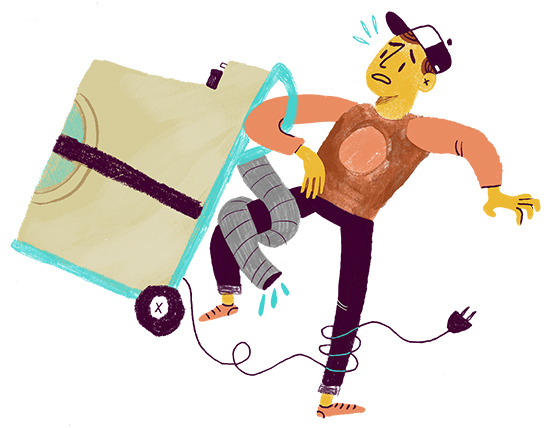 Some movers wrap heavy appliances before trucking them, while others don’t because it can be hard to get a good grip on a wrapped washing machine. If you are picking up your appliance from the rear (and you don’t mind a minor incidental scratch or two on the rear surface), consider keeping that appliance unwrapped until you get it onto your moving truck. To get your appliance, a piece of furniture or stack of boxes onto your hand truck, tip it forward just enough to slip the hand truck’s bottom plate underneath. When you tip your hand truck back onto its wheels, hold the front of your cargo with your hand (and maybe someone else on the other end) to make sure it tips backward with the hand truck, not forward off of it. Protip: When tilting heavy items or stacks of boxes backward onto your truck, put a foot on the bar in between your truck’s wheels to prevent any rollback. Roll straight over all obstacles like bumps, thresholds and stairs. If you go at them at an angle your truck will tip and so will your cargo. And it’s no fun trying to tame two hundred pounds of falling furniture. 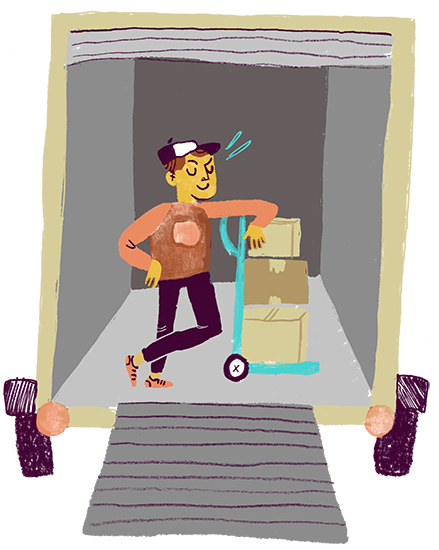 Avoid tilting your hand truck too far backwards when going down those steps. The vertical slats on the rear of the hand truck will slide down the edge of the stair, and if there is too much of a tilt, the wheels might pass right over the next step and create some sudden (and unwanted) momentum. When your cargo is at all unstable, use one hand to hold the top while holding and steering your truck with the other. Use care – and cardboard – wherever you use your hand truck so you don’t scratch your floor or your steps. 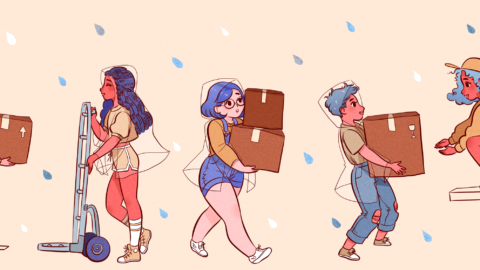 When not in use, keep the moving dolly out of the way! It’ll save you from having to move it with couch in hand, or worse yet, fetching it from underneath your moving truck. Protip: Get a hand truck with a handlebar that runs across the back, not one with two handles that restrict your grip to either side. 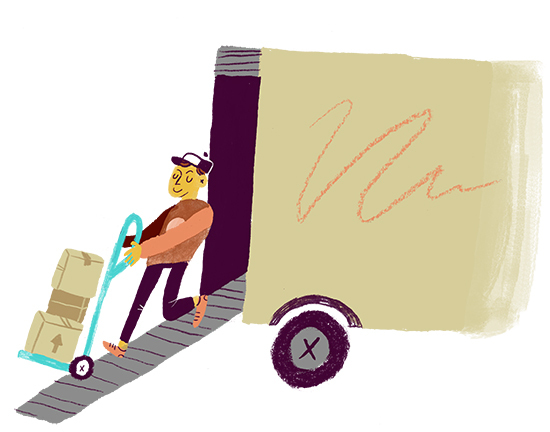 Maneuvering a hand truck might feel awkward at first. That’s okay. Just take it slow, keep it light, and follow the above tips. 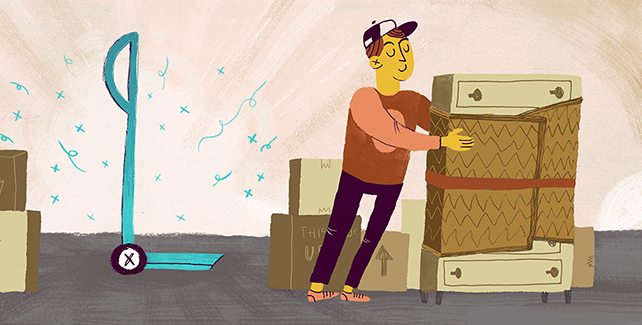 By following these rules, you’ll be rolling furniture around like a pro before you know it.